^ Katsuki, T. & Iketani, H. 2016. 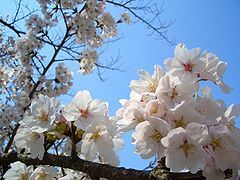 Nomenclature of Tokyo cherry (Cerasus × yedoensis 'Somei-yoshino', Rosaceae) and allied interspecific hybrids based on recent advances in population genetics. Taxon 65(6): 1416.